What stuff are dreams made on? They are made of music. Researchers studying the neuron activity in Zebra Finch brains have discovered that finches -- like ourselves -- dream when they are asleep. And their brain activity mirrors the same patterns that occur during bird song. 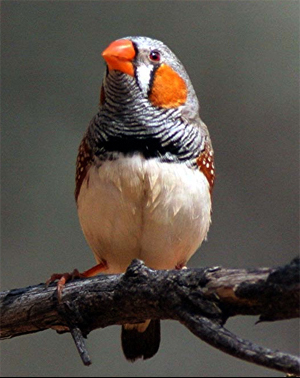 It is easy to see why a song might be important to a Zebra Finch. By advertising his fitness and versatility though a song, the male finch is increasing its chances of reproduction. Male finches use special brain cells that are needed for original songs -- neurons that show a unique ability to regrow each season. Just as human babies do, Zebra Finch chicks find their voices in a series of developmental milestones. First there is a universal "babbling" step of random sounds. By listening to other singers during a sensitive stage of development, the birds refine their songs and ultimately develop the virtuoso ability to adjust their singing depending upon their audience. Tests have shown finches can easily recognize one another by their individual songs. Most of us know it takes practice to whistle. The tiny finch must master a far more difficult task -- modulating the syrinx -- the organ in the bird's throat -- to take advantage of non-linear air vibration patterns. Like an opera singer that alternates between normal voice and high falsetto, the finch is able to create warbling and trilling effects. In fact, the process of producing song is so challanging, female finches are willing to make the ultimate comittment of partnership to a bird capable of a supurb performance. Knowing that with the shadow of his wings He can at pleasure stint their melody.